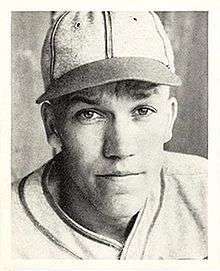 Howard Wilbur Krist (February 28, 1916 – April 23, 1989) was a pitcher in Major League Baseball from 1937 to 1946. "Spud" played his entire career for the St. Louis Cardinals of the National League, and was a member of the 1942 and 1946 World Series Championship teams. Krist's 10–0 record in 1941, his first full season, is the third-best undefeated season ever. He served in the army for two years during World War II and lost his effectiveness as a pitcher. ↑ "The Ballplayers - Howie Krist". baseballlibrary.com. Retrieved 2010-10-26.